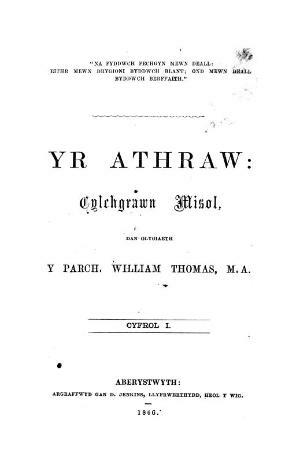 A monthly Welsh language religious periodical that served the Sunday schools of the Unitarian denomination. Alongside articles on religious matters the periodical also published articles on more general subjects, including history and biography. The periodical's editor was the Unitarian minister, writer, schoolmaster and social reformer, William Thomas (Gwilym Marles, 1834-1879).